More pictures are in the liveries section. 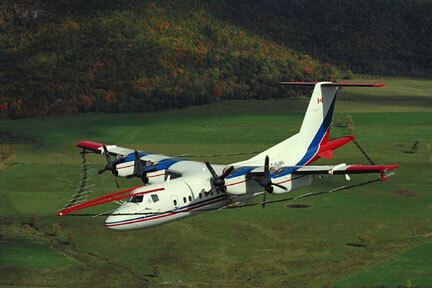 If you want to buy or sell a Dash 7 free aircraft classifieds are available here. 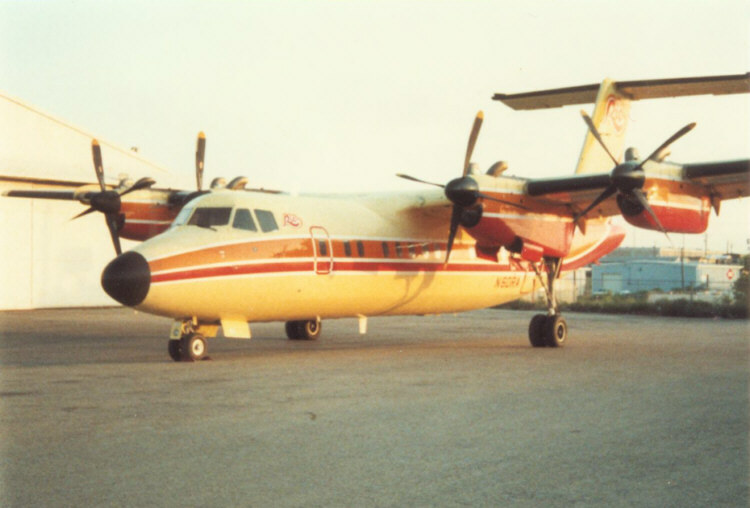 The de Havilland Canada DHC-7 ("Dash 7") was the first STOL Airplane certified according to FAR25 criteria for transport-category aircraft. 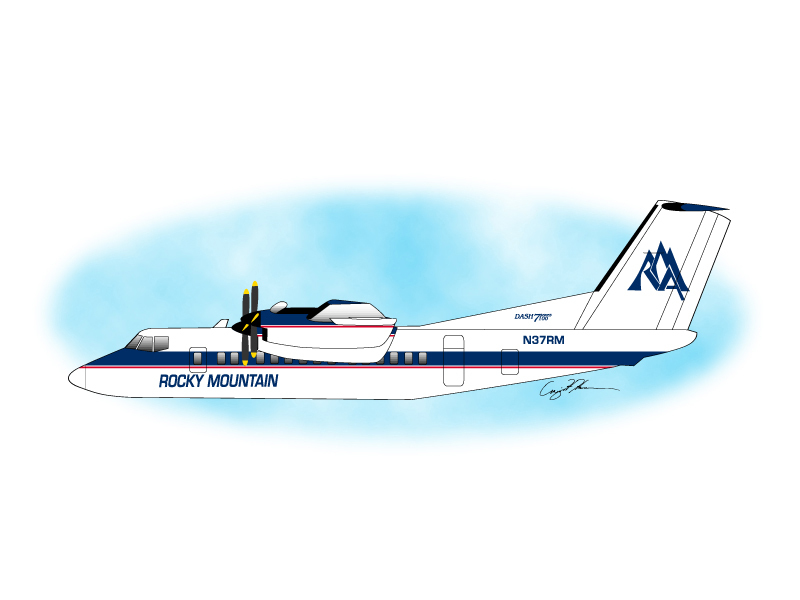 It first flew on March 27th, 1975 and the first airplane was delivered to Rocky Mountain Airways on February 3rd, 1978. After delivery of the 100th airplane in 1984 further sales were slow and after de Havilland was taken over by Boeing production ceased. Many small airlines found a four-engined airliner too costly to operate and the "little sister" Dash 8 could fly most of the routes faster and more economically. City center STOLports did not materialise as expected and there simply were not enough routes to remote airfields with short runways that would still generate enough traffic to justify use of a 50-seater. 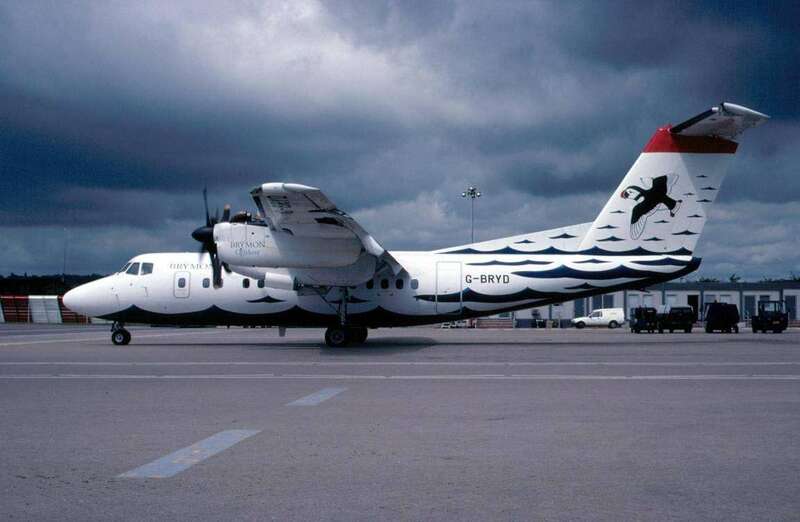 The last Dash 7 (S/N 113) was delivered to Tyrolean Airways in 1989 and the programme was closed with a loss of about 145 million Euro. (A fuselage for a 114th aircraft was partly completed. Due to lack of customers work on the wing was not begun and the fuselage has since been used for various other purposes.) 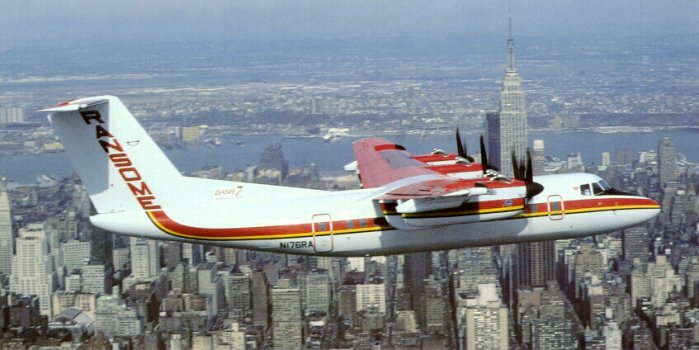 In recent times a number of Dash 7s were completely overhauled, re-engined and converted to O-5A, EO-5B and RC-7B surveillance planes for the US Army. See this excellent site for more info. To achieve optimum short take-off and landing performance the aerodynamics of the airplane have to be optimised for maximum lift at minimum airspeed. If a reasonable cruising speed is desired as well, this requires sophisticated wing flaps. De Havilland developed a system of dual fowler flaps for the Dash 7. The flaps cover 75% of the trailing edge of the wing. Up to 25° they extend together and for 45° the rear part of the flaps is extended a further 20° by hydraulic jacks. At touch-down hydraulic pressure to the extension side is dumped allowing constant pressure to the retraction side to retract the flaps to 25°, thus reducing lift and increasing brake efficiency. The same happens if the power levers are advanced beyond 50% during a go-around. Drag is reduced and the loss in lift is more than compensated by increased power. To achieve sufficient roll control despite the small ailerons two roll spoilers on each wing extend together with the aileron. By reducing lift and increasing drag on the inside wing in a turn they augment roll control. With all three landing gear on the ground and the power levers below 50% the spoilers extend to kill lift and increase drag on landing or aborted take-off. For the same purpose two extra ground spoilers on each wing extend on mainwheel touchdown. Further aerodynamic "tricks" include different wing profiles for the outboard and inboard wing, a drooped leading edge, and a multitude of small fences, fins and "teeth" to energize and control airflow. Four engines leave the airplane with 75% of total power and less pronounced asymmetric thrust in case of an engine failure. This reduces Vmc which in turn allows lower take-off speeds and shorter take-off runs. The slipstream of the propellers covers a large portion of the wing, further increasing lift. This is also valid in the opposite direction with sudden power reductions during the landing flare killing a lot of lift rather abruptly, causing "firm" arrivals and light bruises to the pilot's ego. This effect is enhanced by the adjustment of the propellers which produce drag rather than thrust at flight idle. This de Havilland technology allows precise glidepath control by rapidly varying total drag/thrust without any aerodynamic devices. (Flaps 45° and flight idle result in about -20° pitch at Vfe45). With only 1200 RPM for take-off and as little as 900RPM in cruise the Dash 7 is a good neighbour at airports in the middle of built-up areas. Props are reversible for deceleration on ground but most of the braking is performed with anti-skid equipped wheel brakes (nosewheel brakes were optional). On a maximum performance landing the airplane will be stopped before the engines even reach maximum reverse thrust. The Dash 7 can be certified for ILS approaches up to 7.5° - a normal ILS having 3° - and CAT 2 approaches down to 100ft/30m decision height and 300m/1000ft RVR. Despite all this aerodynamical tricks the Dash 7 is no thoroughbred in cruise. Cruising altitudes above 17.000ft are advisable on cool days only, with the climb rate above FL100 solidly below 1000ft/min and a maximum cruising speed of about 215KTAS. 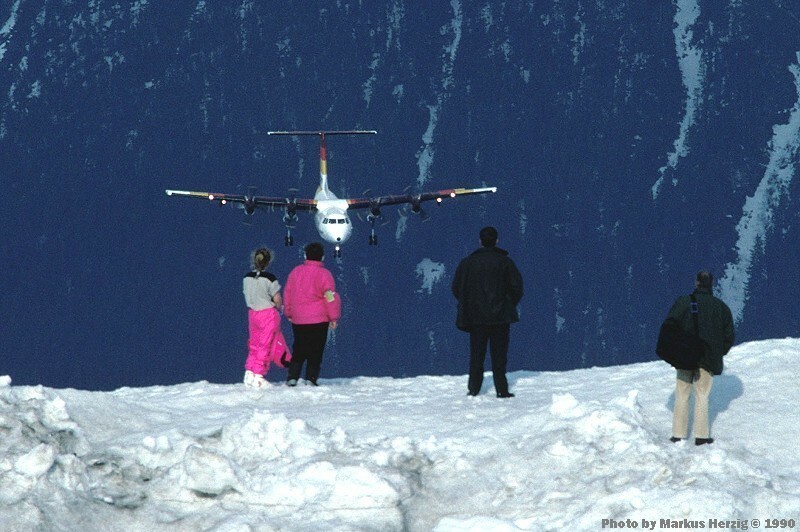 Take-off and landing is where the Dash 7 shines. Maximum Vr (rotation speed) is 85kts with an empty plane lifting off at 70kts. With maximum flaps Vr (speed over threshold) is a leisurly 83kts at max landing weight and 70kts for an almost empty plane. This allows for a landing roll of as little as 125m/400ft; rumour has it, that Dash 7s have turned off at by-pass intersections 70m/230ft beyond the threshold..... Spoilers, anti-skid and reverse make all this feel a lot more solid than light aircraft with comparable performance (e.g. C210, C340). Maximum Landing Weight 19.05t 42.000lb. Maximum Zero Fuel Weight 17.69t 39.000lb. 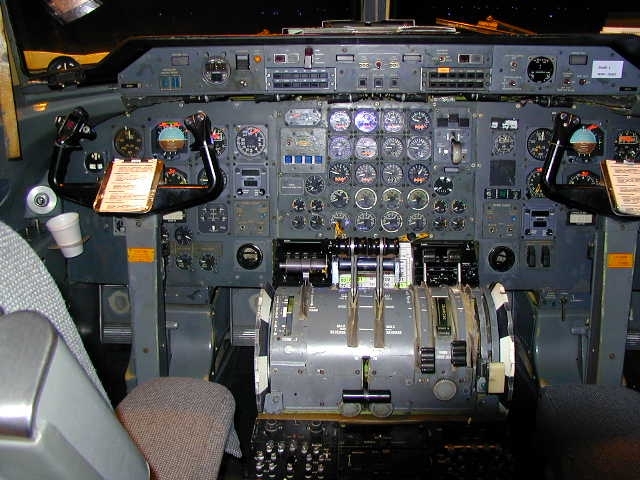 This is a photo of a Dash 7 flight deck by Paul Wiebe. The de Havilland Aircraft of Canada was founded in 1928 as a subsidiary of the English de Havilland aircraft factory. Until WW2 several versions of English-built de Havilland Moths were assembled and sold in Canada. During WW2 two-engined "Mosquito" fighter/bomber/reconnaissance planes were built in Toronto. After WW2 the DHC-1 "Chipmunk" was DHC's first "own" model, followed by the DHC-2 "Beaver" and DHC-3 "Otter", two high-wing utility planes tailored for the Canadian North. They were followed by the DHC-4 "Caribou" and DHC-5 "Buffalo", two twin-engined high-wing STOL transports. The hugely successful DHC-6 "Twin Otter" continued the backcountry success of the Beaver and Caribou with modern turboprop engines and tricycle gear. 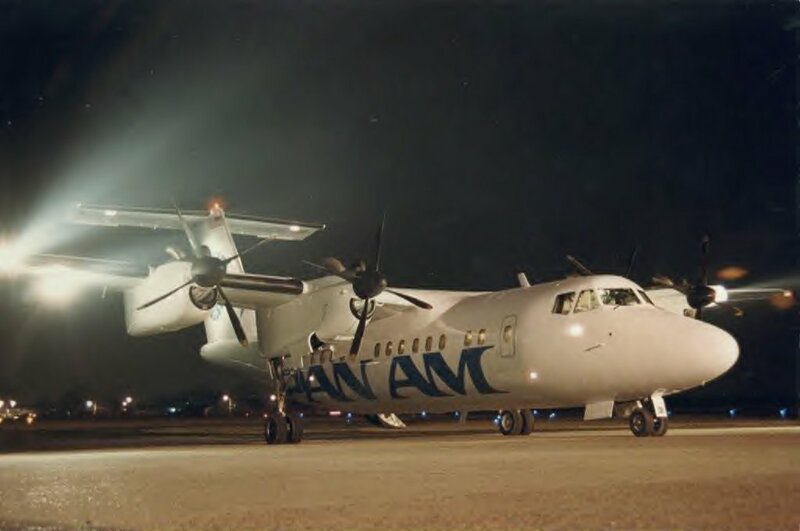 Development of the Dash 7 began in 1972, followed in 1978 by the Dash 8. 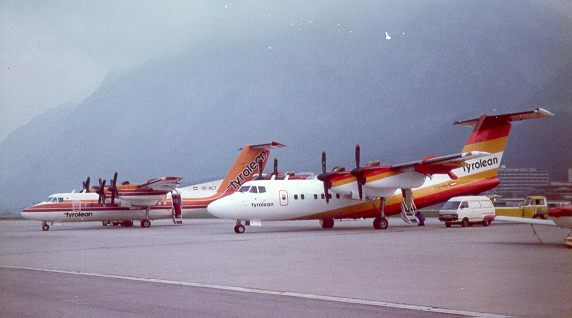 In the mid-80s de Havilland Canada was sold to Boeing and renamed the "Boeing Canada, de Havilland Division". To restore profitability the Dash 7 and Twin Otter production lines were closed and the company concentrated on the more successful Dash 8. 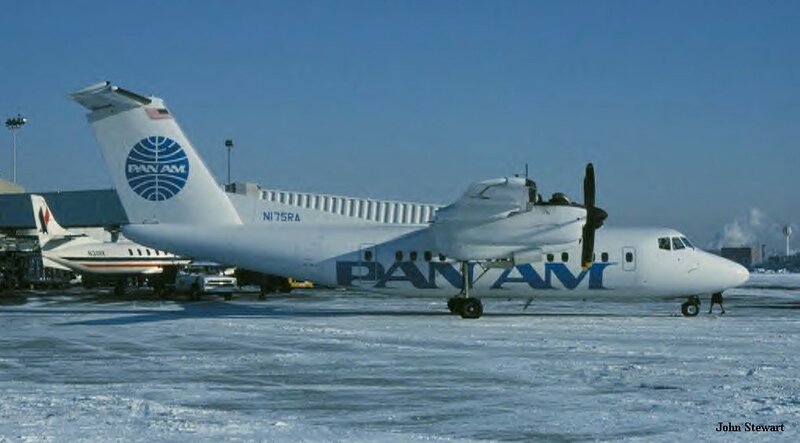 In 1992 de Havilland was sold to Bombardier and together with Canadair of Montral designated the Bombardier Regional Aircraft Division (BRAD). Ito Noriyuki who contributed some of the photos on this page has a nice Propeller Airplane site which also features the Dash 7. PlaneSale has a nice info page with technical details and a cost analysis. A flight simulator for the Dash 7 operated by Flight Safety International is available at Toronto Downsview Airport (Canada). It was not built before the early nineties, long after the last Dash 7 had left the factory. If you don't want to travel to Toronto to experience the Dash 7 you can click here to download Tyrolean Airways Dash 7 files for Microsoft Flight Simulator made by Dennis Wasnich (82K). Milton Shupe is currently coordinating development of a Dash 7 for FS2002. The project progress page is here. A review of the FS 2002 Dash 7 model is available here. 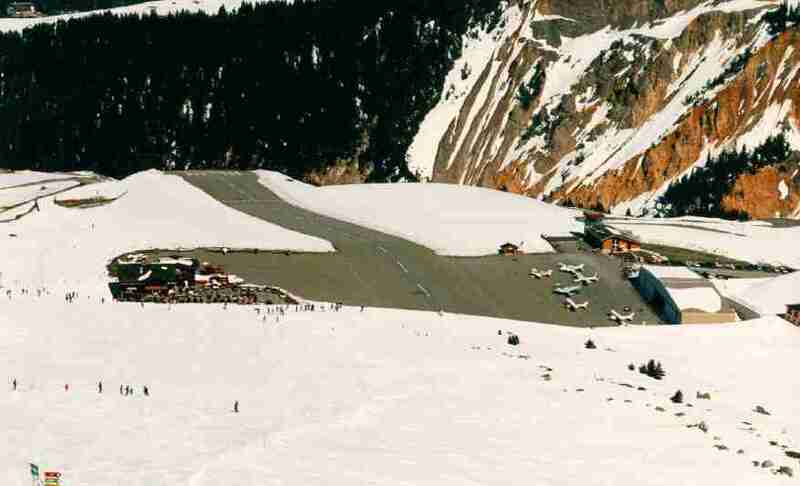 Courchevel (CVF, LFLJ) is an "altiport" in the French alps. It is located in the "trois vallees" about 100km SSW of Geneva and about 50km SSE of Montblanc at an elevation of 6369 to 6580ft (1941 to 2006m) just above the skiing resort of Courchevel 1850 (part of the "trois vallees" skiing area). Its single runway 05/23 is 525m (1720ft) in length with a slope of 12 to 18%, making it (as to my knowledge) the highest hard-surfaced airfield in Europe. Former Courchevel Captain Gerhard Beer has given permission to publish this German article about CVF ops written for the Tyrolean employee magazine. 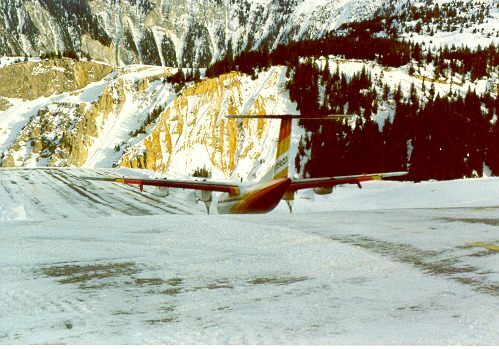 Courchevel Operations were special because there was no way to abort the take-off after brake release, so special power setting procedures ensured that even a combination of engine failure and nosewheel steering failure could be handled safely. 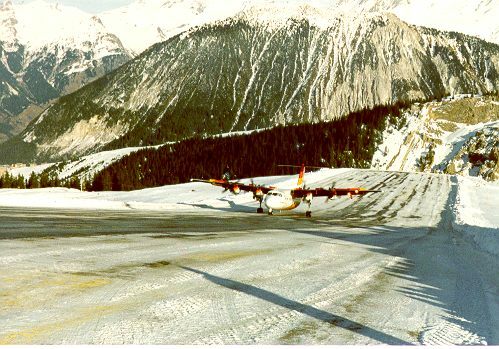 It is a testament to the design qualities of the Dash 7 that she could land in Courchevel without weight limitations and incurred take-off weight limitations only under low pressure/high temperature conditions and even then those limitations were not severa and usually not operationally relevant. You could also say that it's not that hard to take off, when gravity takes care of most of the acceleration required. 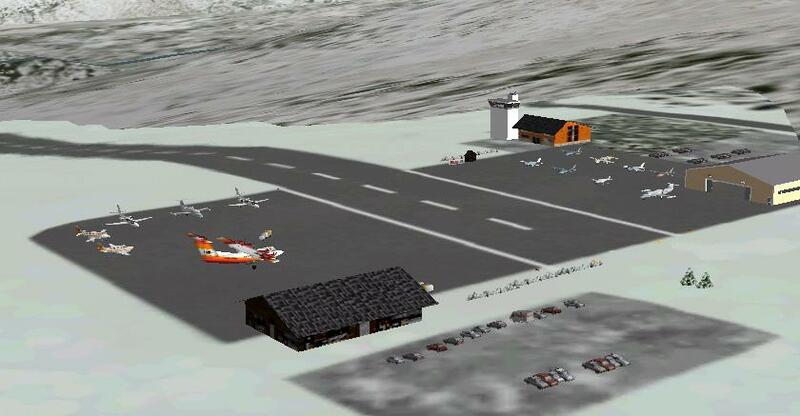 For more information and ordering go to the Reiffer FlightSim page. 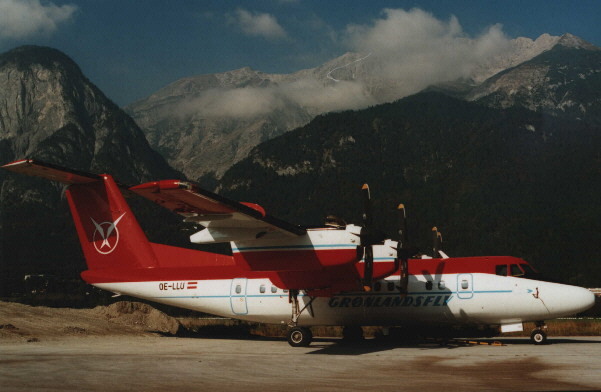 Originally delivered to Tyrolean Airways in 1980 as Tyrolean's first aircraft. Registered as OE-HLS. Later re-registered OE-LLS. In service with Tyrolean until 1995. Sold to FAR Airlines of Milano, Italy and re-registered I-FARB after a very protracted type certification in Italy. 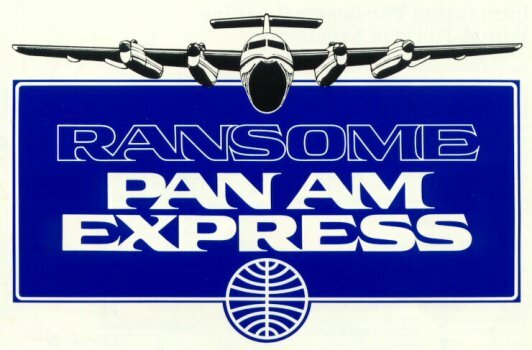 Delivered to Tyrolean Airways in 1980. Originally registered OE-HLT, re-registered OE-LLT. Swapped for s/n 113 in 1988/89. Converted to CAA specifications for service with Brymon Aviation. Last Dash 7 completed. Originally configured for Brymon Aviation according to CAA specifications. 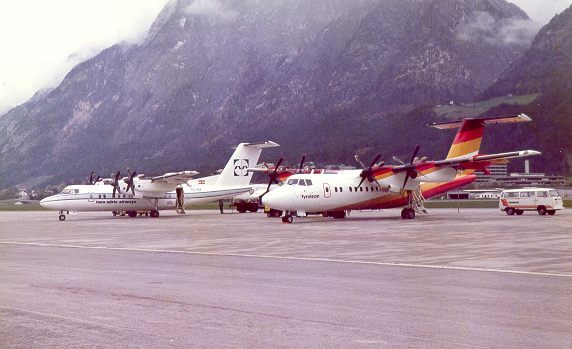 Re-configured for Tyrolean Airways, it was ferried from Southend to Innsbruck on Dec. 19th, 1988, certified by the Austrian CAA (BAZ) on Dec. 29th and entered service with Tyrolean on December 30th/31st, 1988 as OE-LLU. 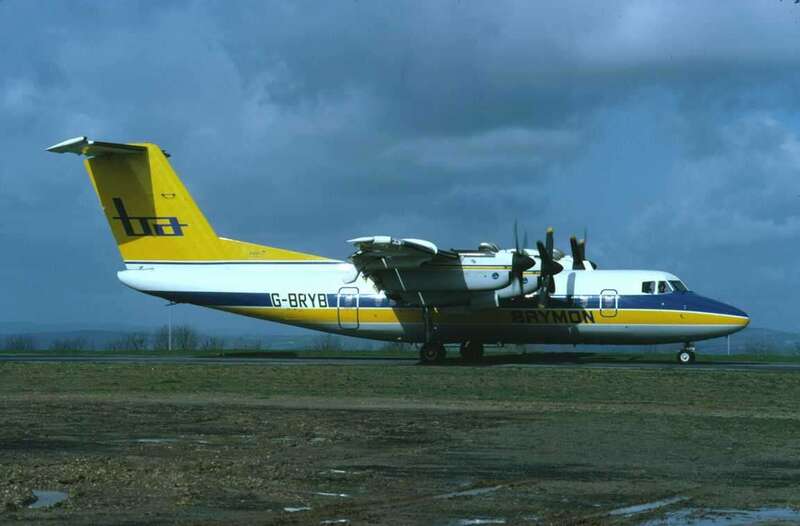 Withdrawn from regular scheduled services in 1996 it was used as stand-by and ad-hoc charter aircraft until late 1997 showing a new all white livery with Tyrolean logo aft of cockpit windows and on vertical tail. Tyrolean airplanes were initially registered OE-HLx according to their weight class (below 20 metric tons / 44.000 lb.) and later re-registered OE-LLx when Tyrolean received a full scheduled services operator certificate (allowing use of the "L" prefix). OE-LLU returning from the paintshop in full Greenlandair livery. October 17th, 1999. Photo by Hawkeye. While many of the remaining Dash 7s are used for special transport needs in remote areas, this is what the airplane was designed for. 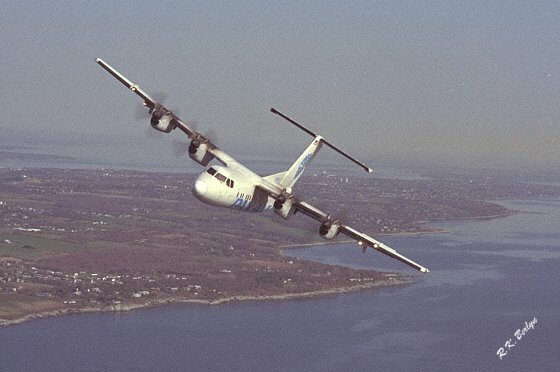 Some Dash 7s have been specially modified to accomplish special missions such as aerial surveying and reconnaissance. 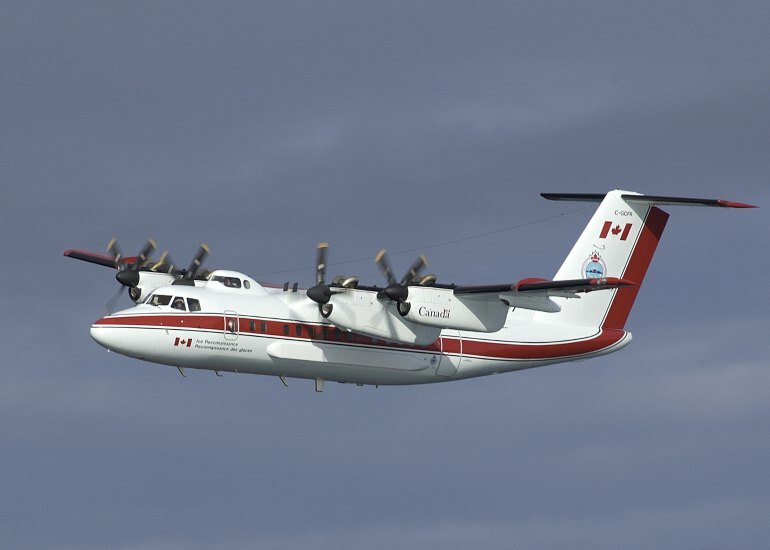 The Canadian Ice Service uses the one and only Dash 7IR-150 for ice surveillance in the Canadian Arctic. It is operated for Ice patrol by Bradley Air Services / First Air for the Canadian government. From January to March the aircraft is based at Summerside PEI, patrolling the Gulf of St. Lawrence. From early April the straight of Belle Isle, Labrador coast, and northern Newfoundland are patrolled from Gander. June is a maintenance period as there is no sea ice in open shipping areas. From July to October the arctic is monitored from Iqaluit (Frobisher Bay, YFB) with sub-bases at Resolute Bay, Inuvik, Fairbanks, and Thule AB (Greenland). The primary support is to the Canadian Coast Guard (CCG) and its fleet of icebreakers who in turn support all shipping in canadian waters. A secondary role is iceberg surveillance as part of Canada's contribution to the North Atlantic Ice Patrol. On deployment the aircraft has an aircrew of pilot, co-pilot, and engineer, with a mission crew of 4 ice service specialists and an electronics technician. 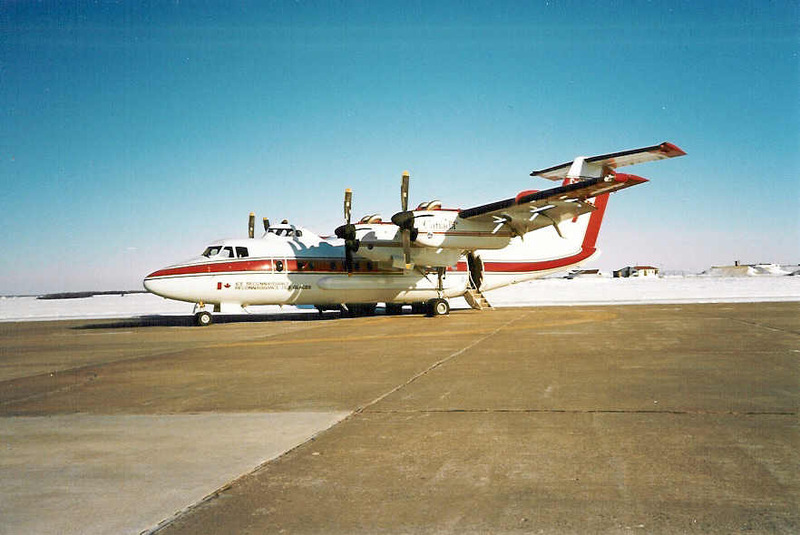 Maintenance in done in the field with the aircraft coming back to Ottawa only between seasonal deployments, at which time any required major servicing is performed. C-GCFR (s/n 102) was the first 150 series made. It was delivered in May, 1986 and holds 18,000 lb. of fuel (with two 4,000 lb. auxiliary tanks inboard of the #2 and #3 engine nacelles.) Fuel dumping is available for the auxiliary tanks to attain maximum landing mass in case of emergency. For normal operations only around 14,000 lb. of fuel are loaded. The aircraft can stay airborne for almost 16 hours with VFR reserves. Due to the extra equipment its operating mass of 31,000 lb. is slightly higher than the usual airline version. Althought the aircraft was built for a 49,000 lb. MTOM it is certified for 47.000 lb. only. (Which is quite a lot of mass to lug around in case of an engine failure anyway....). It has an Observatory dome on top of the fuselage and bubble windows out each side and. A SLAR (side looking airborne radar) can take a continuous picture 100 miles wide. (50 miles on each side of the aircraft). The SLAR can see the ground or icebergs through cloud and at night. Radar and camera images can be sent to ground stations and CCG icebreakers via an S-band downlink transmitter. A glass bottom bay holds a Zeiss large-format mapping camera to take pictures out the bottom of the aircraft. Additionally, it has a drop chute in the back to drop AXBTs (airborne expendable bathytherms that measure and transmit sea temperature from surface to floor) as well as beacons used to measure sea ice and iceberg drift. It has NATO type hard points under the wings but these are not normally used. engines P&W PT6A-50 (as per dehavilland specAEROC 7.1*G,31 Issue "6" Rev.1(DHC-7 150 Series) as amended. 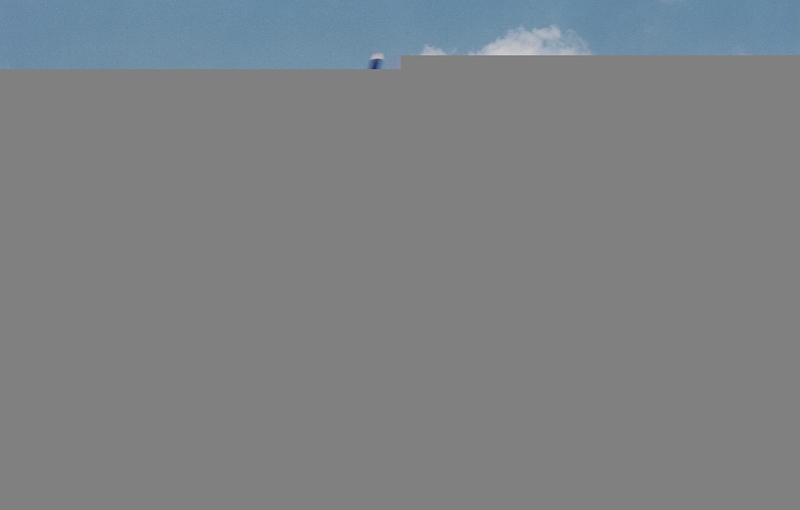 avionics: as per dehavilland spec AEROC 7.1.G*3, Issue "6", Rev.1 (DHC-7 150 Series) as amended. Click Here for a shot in landing configuration. Fugro Airborne Surveys have selected the Dash 7 to carry their MEGATEM airborne electromagnetic (AEM) survey system. Their Dash 7 is equipped with an impressive antenna system and various other appendages. US Army RC-7B "Crazy Hawk" Reconnaissance Plane - a number of Dash 7s were completely overhauled, re-engined and converted to O-5A, EO-5B and RC-7B surveillance planes for the US Army. Also see this site for more info. The main reason for this section is that I don't know the serial numbers of the airplanes shown (yet), so this is mainly a collection of different liveries. 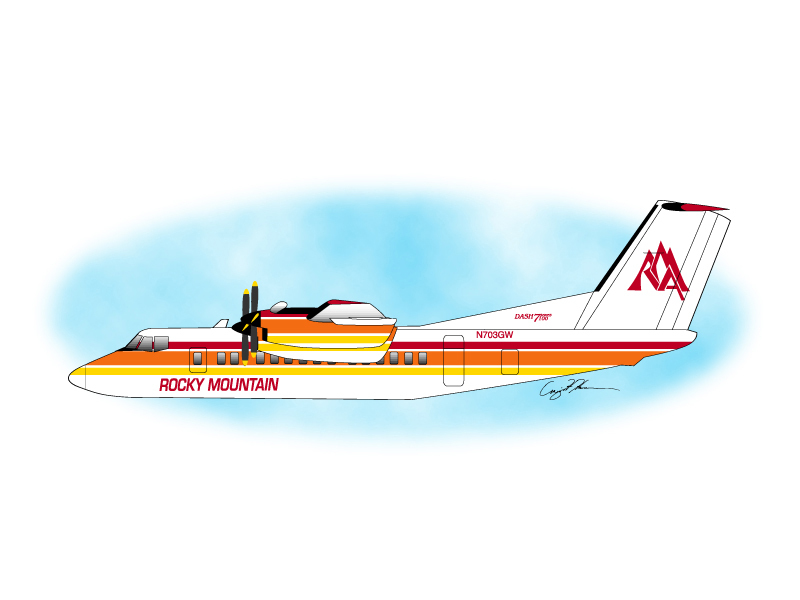 Some drawings of Dash 7 liveries are also available on Karl Mesojednik's Aircraft Art Page. 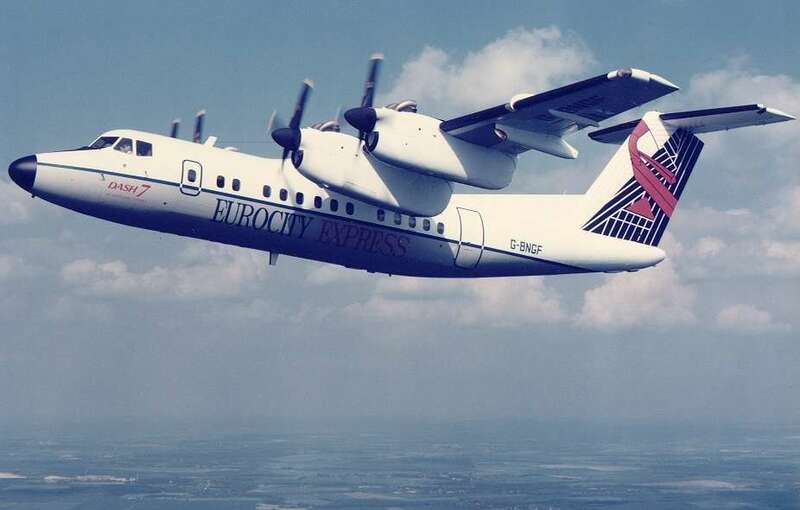 Commercial photo of EuroCity Express' first A/C G-BNGF (sent by John Powell). Click here for full size (413K). For the time this is just an alphabetical list with occasional links. Additional info will be added according to availability. The List does not distinguish between past and present operators. Apart from the Technical Manuals by de Havilland and Flight Safety there seem to be no dedicated Dash 7 books in print. The closest I have come so far is A case study on the de Havilland Family of STOL Commuter Aircraft by Richard D. Hiscocks, former DHC VP Engineering, published by the American Institute of Aeronautics and Astronautics (AIAA) which I found at amazon.com. The technical data on this page is from this booklet as well as some other aircraft encyclopedia. Jane's Transport Press' Air Portfolios 6 by Paul R. Smith covers the DHC-6 (Twin Otter), DHC-7 and DHC-8 but is out of print. CANAV Books have published an excellent general history of de Havilland Canada by Fred Hotson which is available by mail order. With kind permission of the author I have scanned a flight report from the 1991 edition of the UK Pilot magazine. The Dash 7 is a cross between a shirt-and-tie city (center) slicker and outback workhorse. Pilots either love or hate her with little in between. Its less than spectacular performance in the flight levels has done its share to build up a certain reputation. I try to compile some nicknames and sayings here. I got a mail by Capt. Tom Bannon who has flown 36 different Dash 7s and gave a lot of infos regarding "missing" numbers. His 36 S/Ns flown are quite a lot more than my meagre two. Anyone out there who claims a higher number or simply wants to get on the list between Tom and me? Just send me a mail with some info. While watching TV I suddenly saw a Dash 7 right in the middle of a feature movie. Celebrity appearances in TV shows are called "cameo" appearances so I added this section to the Dash 7 homepage to list all Dash 7 spottings in movies, etc. Links are to the IMDB database. The Dash 7 even has its own song performed by WILCO. Although the lyrics are not very friendly, there are not many aircraft with their own song..... The record name is A.M. and the album is available through all the various online music shops. WILCO have kindly given permission to make it available here. Dennis Wasnich, Gerhard Beer, Danny Fyne, Michael Blakesley, Peter Kuncic, Erich Kirchweger, Siegfried Steinlechner, Hawkeye, Markus Köchle, Martin Reiffer, Arkia Airlines Public Relations, Erik Johannesson, Dave Gregg, John Powell, British Antarctic Survey, Ito Noriyuki, Andreas Karotsieris, Jim Baumann, Kevin Jones, Matt Ellis, Rod Dixon, Leon Burdick, Vladimir Kocevar, Thor Johnson, Michael Fritz, Richard Hunt, Paul Robson, Tom Bannon, Rob Koplitz, Chris Becht, Ray Knighton, Gilles Daven, Paul Wiebe, Craig Hansen (who did all the drawings and deserves special thanks for his Welcome banner. c/o American Web, 4040 Dahlia St., Denver, CO 80216, USA), Richard Woods, Juanjo Iglesia, Geir Solbakk, Barry Hubbard, Markus Herzig, Fugro Airborne Surveys, Kevin McClelland, Ole Johan Beck, Rolando Pedraza, Mogens Haahr, Patrice Backer, Glenn Charbonneau, David Bromage, Paul Hobson, Hugh Forbes, Lance Ross, Karl Mesojednik, Asian Spirit, Peter V. Hartmann, Tony Gordillo, Ernst Nathanail, Malcolm Douglas, Berjaya Air, Canadian Ice Service, Leo Kok Ole Johan Beck, Skov Peter Hjorth, Denis Bone. I would also like to thank all Dash 7 enthusiasts maintaining the sites I have linked to. last updated 22JUN17 - ported to new webspace, Springbok ad removed, OE-LLU info, WILCO song and some Courchevel Info added.